THE DEMONSTRATION DAY ASPECT OF THE PROJECT HAS NOW CONCLUDED. In the afternoon there are visits to Wester Balcormo and the new abattoir at Downfield ending around 3.30pm. The full programme and important information about the day which you should read if attending is available here (.PDF, 1.2 MB). You can register for the Fife event NOW using the contact details below. The project is grateful for sponsorship from Tornado Wire and Cairngorm Deerfeeds. 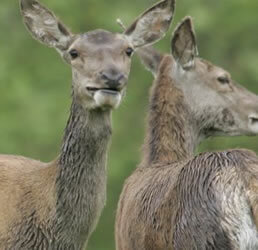 The Deer Farm Demonstration Project is a partnership project between Scotland Food and Drink, NFU Scotland, SFQC Ltd and The Scottish Venison Partnership. The funding has been made available through the SRDP Skills Development Scheme which is jointly funded by The Scottish Government and the European Union. The afternoon session included a ‘walk and talk’ tour led by Rupert Shaw; an ‘in field’ demonstration by Jonathan Holmes, agronomist; and a mobile deer larder exhibit from SMH Products (mobile larder unit range (.PDF, 465 kB). The project is grateful for continued sponsorship from Tornado Wire and Cairngorm Deerfeeds. The full programme and other important information about the day is available to download here (.PDF, 1.3 MB). REGISTER NOW! You can register for the Gledpark event NOW using the contact details below. The programme for the demonstration day at Clathic on 28 July 2015 and important information in relation to the event is available here (.PDF, 1.3 MB). The themes for the day are feeding (Callum Thomson, formerly head deerkeeper at Woburn); finance (Barclays) and fencing (Tornado Wire), with an update from Jamie Landale on how his year is going to date at Clathic, and an on-site talk on handling by Alan Sneddon of the Venison Advisory Service. There are a limited number of places still available. The project is grateful for continued sponsorship from Tornado Wire for the 2015 demonstration days, and also welcomes Cairngorm Deerfeeds as a new sponsor for the rest of the year. The Deer Farm and Park Demonstration Project in 2015 will be based at a number of different locations. Venues will be Clathic, Crieff, Perthshire (courtesy of Jamie Landale), and Gledpark, Borgue, Dumfries & Galloway (courtesy of Rupert Shaw). There will be two days held at each location and a final day in Fife. More information and the programme for Day 1 at Clathic, 12 May 2015 available here (.PDF, 1.3 MB). Please read and note carefully if you are attending. There is a car park at the Towie Hall, and overspill parking at Towie Church adjoining. The hall is immediately opposite Towie School. Please park safely and responsibly. For parking at Culquoich Farm please park as directed. A free soup and sandwich lunch is provided. Those with special dietary requirements/ food allergies etc are asked to bring their own lunch as a precaution. Some aspects of the afternoon farm sessions are unsuitable for disabled access. Please ensure that everyone registers separately at Towie Hall (a registration sheet will be circulated) giving name, business, e-mail address and contact phone number to ensure the Project organisers can contact you about future days/events. Culquoich is a working farm – please observe all safety notices and instructions during the visit. Please bring suitable outdoor clothing and footwear for the afternoon session. Foot dips and brushes will be available at the farm and must be used for bio-security. Please also ensure that vehicles have been cleaned. We recommend that you bring binoculars. All are asked to comply with simple on farm hygiene instructions, use of hand wash and sterilizing gels if in contact with animals etc. We will not be providing accompanying notes for the project days. All presentations will be available on the project website following each event. We recommend that you bring a notebook. There will be a Feedback Form for completion following the morning session. Comments on the afternoon session can be given online. You may also be asked to participate in the concurrent Deer Farm Research Project being run by Aberdeen University, The Hutton Research Institute and the Scottish Venison Partnership. Your support for this would be appreciated. The Deer Farm Demonstration Project is a partnership project between Scotland Food and Drink, NFU Scotland, SFQC Ltd, The Scottish Venison Partnership and Culquoich Farm. The funding is being made available through the SRDP Skills Development Scheme which is jointly funded by The Scottish Government and the European Union.